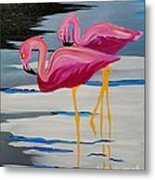 Two Flamingo's In Acrylic by Janice Pariza - 6.250" x 8.000"
Two Flamingo's In Acrylic framed print by Janice Pariza. Bring your print to life with hundreds of different frame and mat combinations. 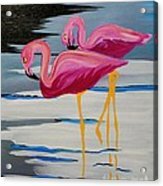 Our framed prints are assembled, packaged, and shipped by our expert framing staff and delivered "ready to hang" with pre-attached hanging wire, mounting hooks, and nails. So lovely Janice! :) L/! Congratulations on 2nd place. 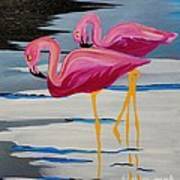 Best Flamingo Painting. April 2015. Well done.